Southborough middle school music director Jamie Clark, the main character (and real-life dude) in Mr. Clark’s Big Band, and I will be making a joint appearance on Saturday, Feb. 17 from 11:25 a.m. through noon with “The Saturday Swing Session with Howard Caplan” on WICN Public Radio 90.5 FM. 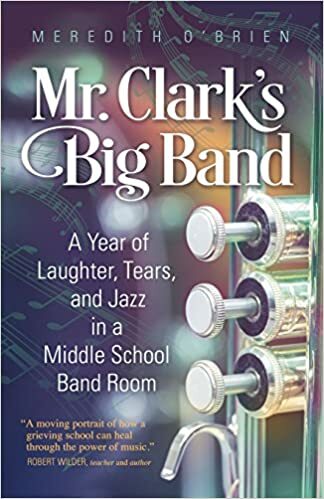 Clark and I will be talking about the history of the Trottier Middle School’s elite Big Band, including its evolution, and the shelf-load of awards it has accumulated during Clark’s tenure, as well as how the book Mr. Clark’s Big Band, about the 2012-2013 Big Band, came to be. Excerpts of recordings of Trottier Big Bands, including the ensemble featured in the book, will be played during the broadcast. Over the Fourth of July week I once again shadowed Southborough’s Trottier Middle School music director Jamie Clark. Only this time, it was to watch him play his trombone with his brass quintet, Brass Venture (see below), during the Bar Harbor Music Festival, as well as sign copies of Mr. Clark’s Big Band before and after Brass Venture’s performances. affection they still hold for their music directors. Several folks said they miss their own days in middle school band rooms. 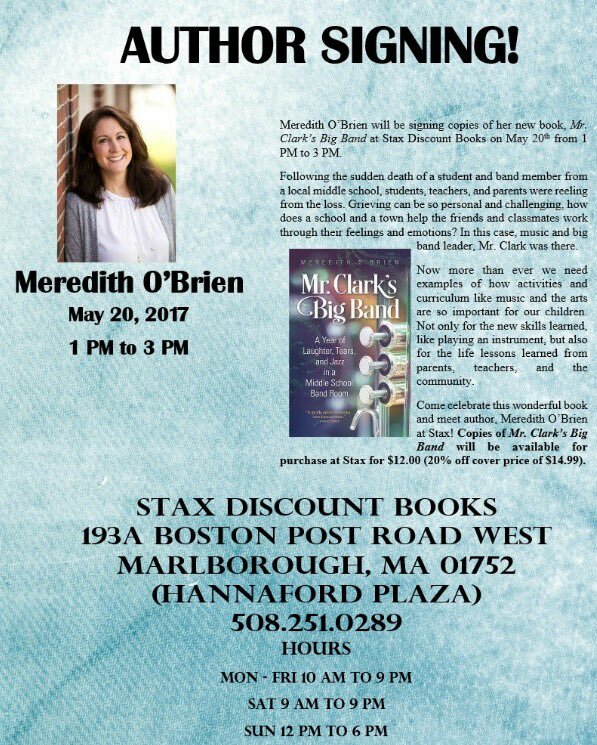 If you happen to be in Bar Harbor, I left behind some signed copies of Mr. Clark’s Big Band at Sherman’s. I am no musician. Although I may attempt to sing along with Adele while I’m driving, much to the mortification of my younger son, I am nowhere in the zip code of in tune. Sheet music reads like a foreign language to me. And yet, I’ve recently learned how potent a tool music can be when wielded by a compassionate teacher seeking to help students channel challenging emotions through their instruments. Thus began a recent essay I wrote reflecting upon my time shadowing the Southborough, MA middle school jazz band, and its director Jamie Clark, for a year. “Music lessons from Mr. Clark,” published by Gatehouse Media, was written in the closing days of my son Jonah’s high school career, highlighted by the nine years he played music, drums and jazz specifically, in school ensembles. I was feeling nostalgic and grateful for the months I spent quietly sitting off to the side of the Trottier Middle School band room, notebook and pen in hand as I watched. And learned. I didn’t learn how to read sheet music. I still couldn’t sing. I couldn’t blow a note on a trumpet, but I learned, firsthand, about the stunning power of music and one teacher to give young people the guidance, safety and comfort they desperately needed in order to move on. 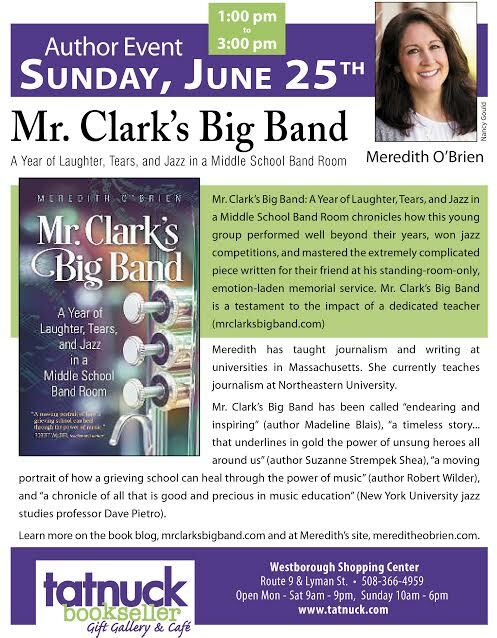 Baystate Parent Magazine’s editor Melissa Shaw spent a lot of time speaking with me about the several-years-long process of writing and researching of Mr. Clark’s Big Band. Her piece about the book, about Jamie Clark, and about Suzy Green’s reaction to the project, is featured in the July issue of the magazine. Shaw watched Clark in action herself when she took photos of him (see above) conducting the Trottier Big Band at their Massachusetts Association of Jazz Educators competition, in which they received top honors. The book follows the band members and Clark through the 2012-2013 school year, all leading up to a year-end memorial service, at which the group would play a brand-new, professionally composed jazz piece commissioned in [Eric] Green’s memory. “Kaleidoscope,” created by composer Erik Morales, is described as an “incredibly unique” and complicated swing number that proved difficult for the young musicians, thanks to scheduling and emotions. “Afterwards, they were in the cafeteria, acting like kids, they seemed happy,” she recalls. “They seemed, like, ‘We did it. We’ve honored him,’ almost giving themselves permission to move on. But that whole fear of disrespecting him, I felt, hung over them the whole year. Image credit: Melissa Shaw, Baystate Parent.